Personal tours are a wonderful opportunity for you to experience and learn more about our program, and most importantly, how it will benefit your child academically, spiritually and socially. Tours are available year-round. Contact our Advancement Director, Christine Willard, to schedule a school tour today at (856) 783-3088, or email cwillard@jp2rs.org. Attending Open House is another ideal way to learn more about our school. During these events, you will have the opportunity to tour our campus and meet students, faculty, and parents. 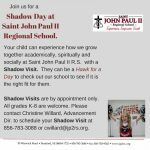 Your child can be a “Hawk for a Day” and shadow a current student. 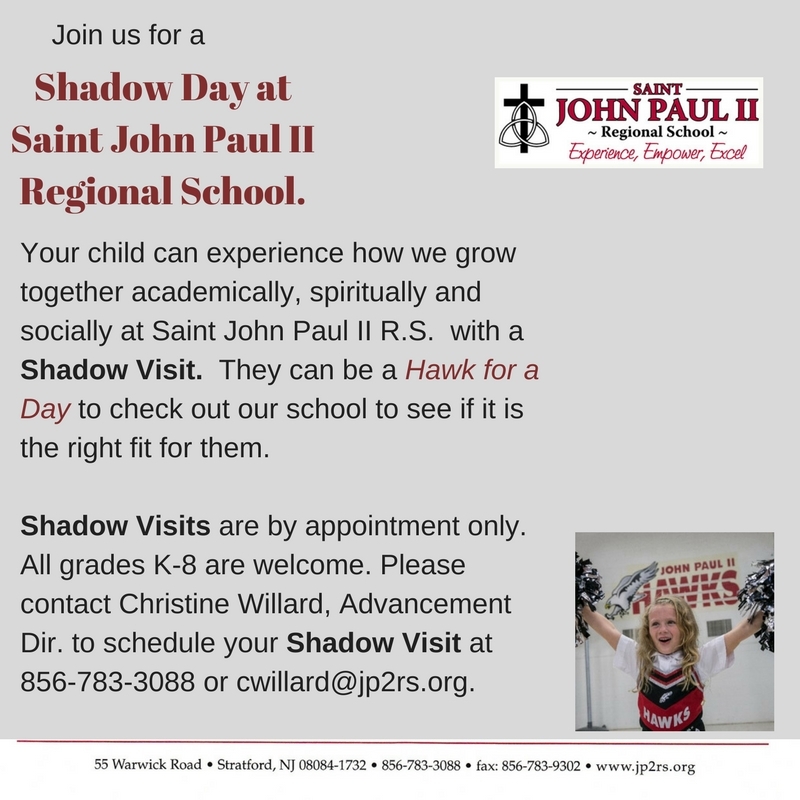 It is a wonderful opportunity for your child to experience St. John Paul II School, meet our teachers and students, and become more familiar with our program and campus. To schedule a day or for more information, contact our Advancement Director, Christine Willard, at (856) 783-3088 or email cwillard@jp2rs.org. "As the end of kindergarten approached, I really struggled with an important decision that would shape the rest of my son's educational career! I had many sleepless nights debating whether I should keep my son in public school or transfer to Saint John Paul II for first grade. Even after making the decision to transfer, I second guessed myself thinking, "Is private school really worth it?" My answer came when my son brought home his Thanksgiving project. On it, when asked what he was thankful for, number one on his list, above all else was God! What more could any parent ask for? I sleep just fine now ;)"